Laura Haringsma, a third-year bachelor of science student, bangs her thunder sticks during Create activities at UBC’s Okanagan campus on Tuesday. It is a full house at UBC this fall. The evidence is apparent, as thousands of students arrive on the Okanagan campus today to participate in Create, the student orientation program that kicks off the new school year. Newcomers to UBC will learn about the people, places, activities and resources as they explore their new university home and get the program-specific information they need to get started on their academic path. Classes start Wednesday with a record number of students registered for the 2012-13 winter session. The seven-year-old campus has reached capacity with 8,307 full-time enrolments. That is up from 7,932 last year. With the seven-year, $400-million campus construction phase largely complete, UBC embarks on a new era with a new chief steward at the helm of the Okanagan campus. UBC’s focus now shifts to building from within, says Deputy Vice Chancellor Deborah Buszard, who assumed her five-year appointment at UBC in July. “The bricks and mortar are in place. Now our mission is to build from our academic foundation,” says Buszard. “We have hired new faculty, added new programs and compiled an enviable track record of research. We are strengthening our expertise to provide students with the best education possible. Buszard says among her goals are ensuring students have full access to scholarships and bursaries, with faculty gaining every advantage to obtain research grants and awards. Fred Vogt, deputy registrar, says the enrollment growth at the Okanagan campus reflects the strong reputation that UBC has achieved. 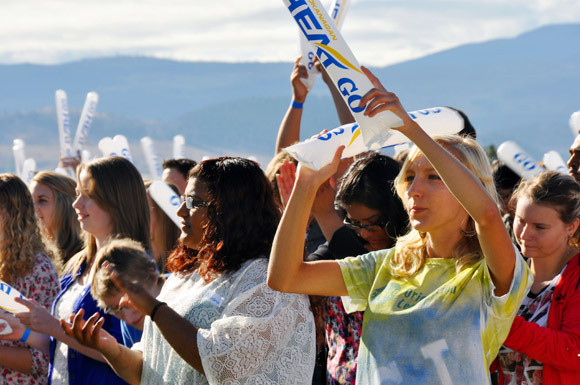 “Year over year, UBC’s Okanagan campus has become the university of choice for more students,” says Vogt. Among the 7,652 undergraduates, there are 1,933 first-year new to UBC students, including 1,205 from BC high schools. The overall student population of 8,307 includes 655 graduate students. There are a total of 684 international students including 541 international undergraduate students, including 218 first-year UBC students. International students represent 81 countries. Overall enrollment at UBC’s Vancouver campus is projected to be 48,768, including 38,388 undergraduates and 10,380 graduate students, remaining at the same level as last year.